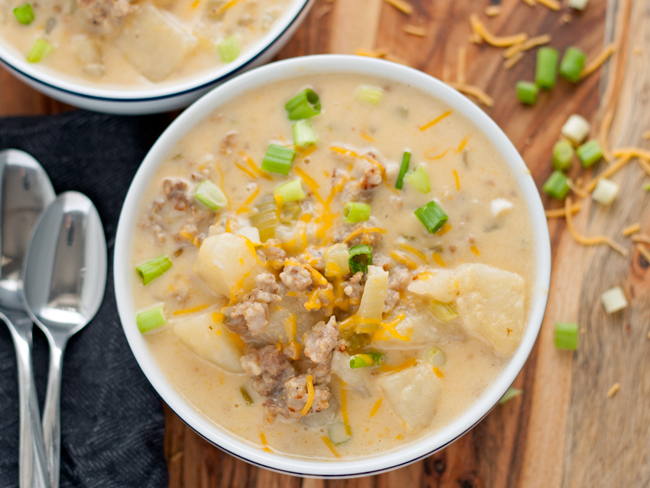 Get your hands on a bowl of this Cheesy Italian Sausage Potato Chowder – a easy and delicious hearty soup that’s perfect for chilly nights! Hi everyone, Jenny from Honey and Birch again! Here in Chicago, we joke that there are only two seasons – winter and construction. In the blog world, it’s the opposite – there are more seasons than I can mention. There’s pumpkin season, cookie season, tomato season, apple season… I could go on and on. As I was pulling on a second sweater and pair of socks the other day, I realized soup season had arrived. Which is awesome, cause it is my favorite. I am a year-round soup eater; even if it is 100 degrees outside, I won’t turn down a hot bowl of soup. Soup season helps my psyche however – people really do give you weird looks when you order chicken noodle soup during the middle of summer. 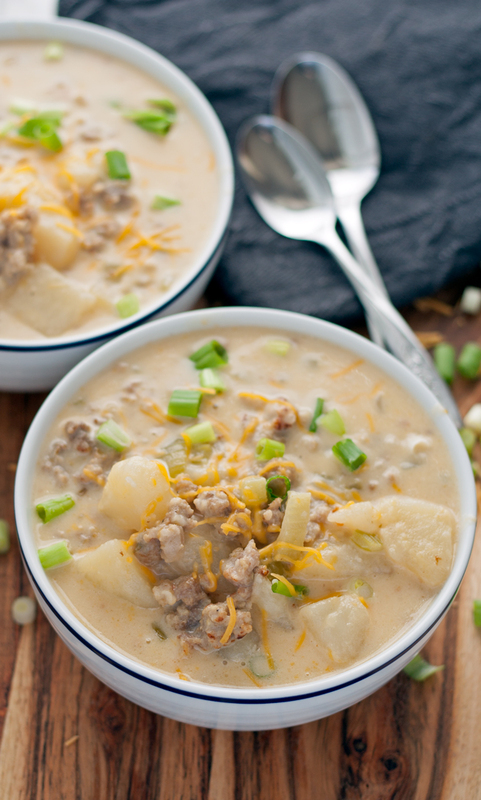 If you are a soup lover like me, you are going to want to get your hands on a bowl of this cheesy Italian sausage potato chowder. 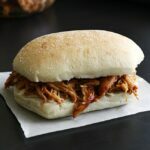 It’s hearty enough for lunch – pair it with a small salad and you’re good to go! It’s also pretty easy to make. 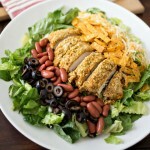 Or grab a big bowl and have this for dinner – you won’t regret it! In a pan, heat the olive oil over medium heat. When hot, add the onions. Sauté until translucent and add the Italian sausage. 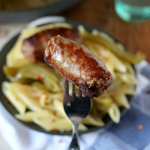 Break apart the sausage with a spoon and stir occasionally. When the sausage is brown, remove from heat. 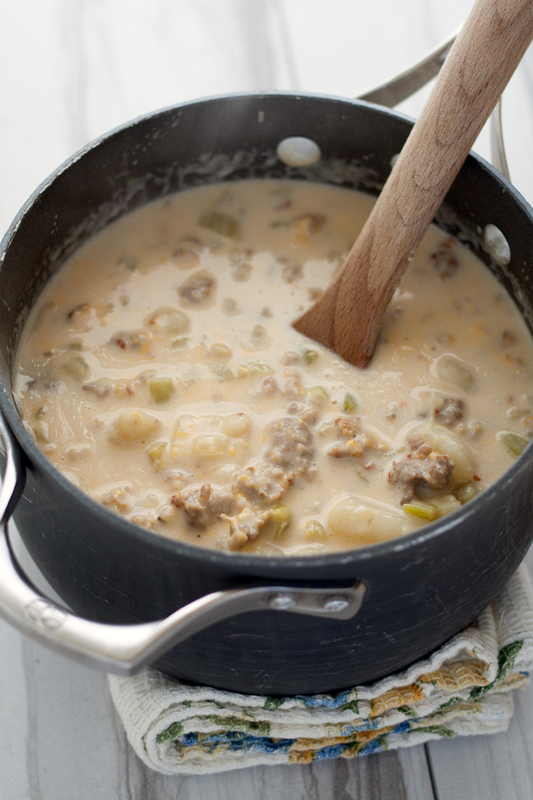 In a soup pot, combine the potatoes, chicken stock and celery. Over medium-high heat, bring to a boil. Reduce heat to medium and simmer for 20 minutes, or until the potatoes are tender. Use a slotted spoon to transfer the cooked sausage and onions to the soup pot. 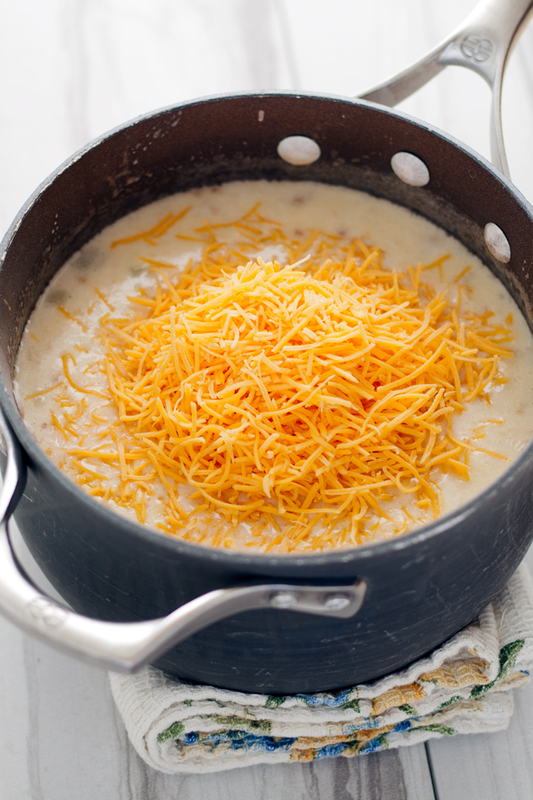 Add the cream and cheddar cheese, stirring until all ingredients are combined and warmed again. Serve with additional cheddar cheese and green onions sprinkled on top. Looking for more soup recipes? Try these! This soup looks amazing! It’s officially been added to the menu plan for next week! 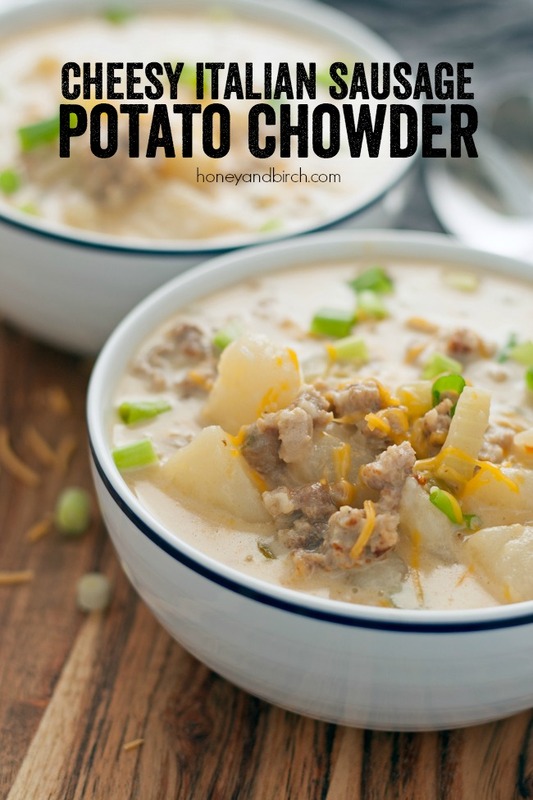 Made this a couple weeks ago & it is soooo delish & fairly easy (my first time making chowder)! Even my sis who doesn’t usually like chowder devoured it. Plan to make again this weekend.. Thank you for sharing! I found your recipe on Pinterest yesterday and had most of the ingredients. I adjusted to what I had handy and personal taste preferences. I halved the meat, added a little more potato and a can of corn. I didn’t have cream so I used milk but you’d never know it. 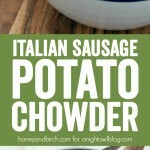 It was so creamy and really full of flavor from the Italian sausage. 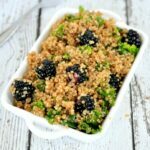 Thanks so much for sharing your time and recipe! I love this soup, I’m hooked on it.. So happy to hear that, Mary! Thank you for sharing! Oh yum yum yum, made this chowder today & it was fabulous!! Thank u for this recipe!